An opening keynote presentation by Sam Bickersteth will set the scene regarding the problematic issues of knowledge fragmentation and information overload in the field of climate change research, policy and practice and will be followed by two engaging presentations from SEI staff and an interactive panel discussion. Collectively, we hope to explore the ways in which we, through our research and that of the wider community are trying to address climate knowledge use for action e.g. by improving the translation, communication and accessibility of climate information, be that about climate risk, finance, policy, lessons learnt or other issues. As such, it will be an opportunity to share our many collaborations, innovative ongoing activities and future plans, as well as discuss lead up to COP21 and implications for the post-2015 agenda. 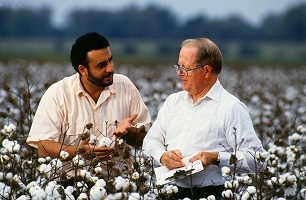 Image: cotton growing, courtesy USDA.